Jahana Hayes reached out to supporters of Manny Sanchez, a rival. At the chaotic conclusion of her congressional nominating convention Monday, teacher Jahana Hayes briefly had at least 171 votes, the minimum necessary to win. Young spectators, some of them Hayes’s former students getting their first peek at politics, wildly cheered Connecticut’s endorsement of a black woman for Congress. Then the chairman of the New Britain delegation, Bill Shortell, stepped forward to announce vote switches in his delegation, an integral part of every convention that allows, even encourages deal-making before the vote closes. Three times he announced a switch, each a loss for Hayes. The changes helped flip a lead for Hayes, a newcomer who had come to prominence as a national teacher of the year in 2016, charming President Obama at the White House and Ellen DeGeneres on television, to the advantage of Mary Glassman, a New Britain native with long experience as an elected official in Simsbury. The tally finally was announced: 173 for Glassman, 167 for Hayes. Glassman, who opened her campaign on April 2, the day U.S. Rep. Elizabeth Esty of the 5th District abruptly quit the race over mishandling of a sexual harassment complaint, had survived a surge for Hayes encouraged by U.S. Sen. Chris Murphy and others. They saw Hayes as a charismatic talent, a fresh face and potential groundbreaker as the first black Democrat nominated for Congress in Connecticut. Now, five days later as the Democrats open their two-day convention, a political debut that could have been a feel-good moment for Democrats, no matter who ultimately wins the nomination in a primary in August, has turned into something else, with angry questions from the NAACP about the motives for the vote-switching away from a black woman, resentment from some Glassman delegates about Murphy’s involvement — and just a whiff of a voting irregularity. Shortell had announced three vote switches Monday night. But his paperwork recorded only one. State party officials, who were informed of the discrepancy Thursday by Ken Curran, a Murphy staffer who is Democratic chairman in Waterbury, were uncertain what happened Monday — or what might happen now. Under party rules, a dispute resolution committee of three to five Democratic State Central Committee members could be empaneled if one is requested by a delegate or someone else with a stake in the convention. If so, the solution could be a matter of two New Britain delegates signing affidavits attesting to their switches. 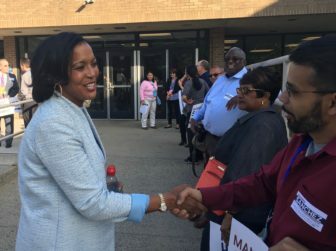 The Hayes campaign is not asking for an investigation, mindful that asking the party establishment to set aside a convention vote undermines an element of their candidate’s appeal: She is from outside a system that never has produced a black nominee for Congress or any statewide office besides treasurer. On Monday night, Hayes was upbeat, marveling at how close she had come in 12 days as a candidate. In an interview Friday, she reinforced that message, saying it was appropriate that the endorsement was not handed to her. Scott X. Esdaile, president of the Connecticut NAACP, was less sanguine. The combination of the frantic vote-switching, however legal, and the questionable paperwork from New Britain makes him suspicous. Reached by telephone at an NAACP conference in Utah, Esdaile said the Democratic Party needs to investigate and explain. 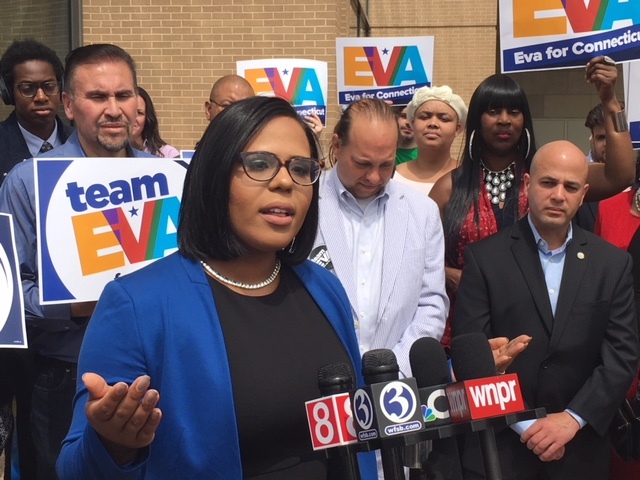 Esdaile said black voters, who generally are the most reliable part of the Democratic coalition, were angry at the combination of the 5th District convention and the gubernatorial frontrunner, Ned Lamont, choosing Susan Bysiewicz as his running mate. Lamont had raised an expectation he would picking a black or Hispanic candidate. “We give so much to the party, and we keep getting screwed by it,” he said. Eva Bermudez Zimmerman outside the Connecticut Convention Center on Friday. Eva Bermudez Zimmerman, a Puerto Rican labor activist, intends to challenge Bysiewicz for the nomination at the state convention in Hartford on Saturday. On Monday night, other delegations announced vote switches at the 5th District convention, a practice allowed by the rules and common to Democratic and Republican conventions in Connecticut, a state with a hybrid nominating system of conventions dominated by insiders and relatively open primaries. The convention system rewards politicians with deep ties to the activists who tend to be delegates. But the spotlight fell brightest on New Britain, whose 37 delegates committed to a favorite son, Alderman Manny Sanchez, on the first ballot. Winning enough votes to primary on that ballot, he released his delegates on the second. Glassman won 26 of the New Britain delegates on the second, but it wasn’t enough. After the switches, Glassman had 29 votes from New Britain, where she grew up, raised by a single mother after her father died. The voting system is simple: Each delegation chair has a form with the name of every delegate from their community. The chair tallies the delegation vote, getting the signature of every delegate next to their choice of candidate. There is a separate form for vote switches: Any delegate who changes must sign, identifying the new choice. On Shortell’s paperwork, he identifies only one delegate, Peter Kochol, who switched from Hayes to Glassman. In an interview, he declined to identify the other two, saying he should speak first to party officials about the matter rather than the press. Robert Berriault, who says he also switched his vote, said, “When it comes to close votes like that, you have to do what’s best for New Britain.” Glassman got the edge as a New Britain native. Murphy had no apologies for his involvement, saying he had a right to offer an opinion. He said the Democrats are well-served by a primary between Glassman and Hayes, each of whom would be a good addition to the Connecticut delegation. Esdaile was unimpressed by the idea that delegates resented Murphy’s encouragement of Hayes. He saw nothing wrong with a U.S. senator trying to bring Hayes into a game decidedly difficult for outsiders. Glassman, twice a candidate for lieutenant governor as well as a former first selectman of Simsbury, used the Murphy angle to frame her campaign as the underdog. Mark Bergman, an adviser to Glassman’s campaign, said Glassman came into the convention facing a candidate who seemed wired for victory, played by the rules and won. Hayes sounded a similar note, the same tune played Monday night. Chris Murphy talking to reporters Friday outside the state convention. Hayes said her only regret Monday night was how the convention looked to the uninitiated, who were confused, then angry to see the mad scrambling before the vote was closed and tally announced. A former student who came home from college in New Orleans was sobbing after the convention. Hayes said she reached out to the students, explaining the process. 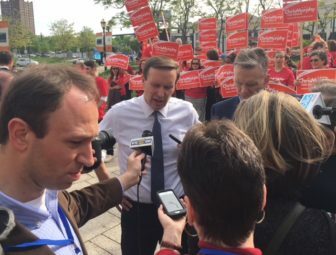 Outside the state convention on Friday, Murphy wondered if the time had come to forgo conventions.